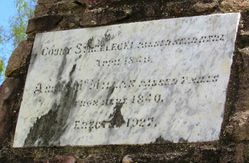 A cairn commemorates the explorers Count Paul Edmund de Strzelecki and Angus McMillan who passed through the area in 1840. They crossed the Thomson River near present Heyfield in separate explorations of the Gippsland area. At the unveiling of the Bulla memorial for Hume and Hovell,Charles Daley the Secretary of the Victorian Historical Society suggested that the idea be extended to other explorers and a committee was formed to mark out the routes of Charles Sturt, Thomas Mitchell, Angus McMillan, and Sir Edmund Paul de Strzelecki. HEYFIELD, Wednesday. — The memorial cairn erected to the memory of McMillan and Strezleckie (sic) was unveiled this afternoon by Lord Somers, in the presence of one of the largest gatherings ever seen in Heyfield. Cr. Fitzpatrick presided, and welcomed the Governor and members of the historical memorials committee. Lord Somers expressed pleasure at seeing so large an attendance, which demonstrated the pride in their connection with the old country and in the valuable work done by the explorers of Gippsland. 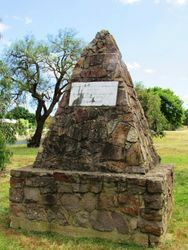 Mr. Hansford said this was the first memorial erected to Strezleckie (sic), and described his travels, the abandonment of his horses, and his final arrival at Westernport on foot, practically without food. Afternoon tea was provided in the mechanics' institute, and the Governor personally thanked each lady member on the refreshment committee, after which the party, left for Rosedale. During the afternoon Lord Somers renewed acquaintance with an old colleague, Mr. W. Crowe, of Glenmaggie. Age (Melbourne), 7 April 1927. Public interest in Angus McMillan and Sir Paul Edmund de Strzelecki was initiated in a 1920`s campaign to recognise the European explorers in Victoria, and a chain of commemorative cairns was erected across the region. McMillan’s contribution to the region was also conferred in naming the Federal Electoral Division of McMillan in 1948, which includes original lands of the Gunai Kurnai in west and south Gippsland. The view of McMillan as heroic explorer and pioneer was disrupted in the late 1970`s when historian Peter Gardner highlighted the extent of the frontier conflict in Gippsland, naming McMillan as a key figure. The attack on the Brataualung camped at Warrigal Creek following the murder of Ronald Macalister in 1843 was the foremost of several incidents that resulted in the loss of Gunai Kurnai lives. Historian Don Watson named McMillan as the leader of the ‘Highland Brigade’, a group of Gaelic-speaking Scotsmen who conducted reprisals against the Gunai Kurnai. The extent of McMillan’s leadership of these conflicts has been contested although his own accounts indicate that he was involved. McMillan was responsible for raising fears of a European woman held captive by the Gunai Kurnai, firstly in 1840 and again in 1846 - 47. Little was made of the earlier claim, but in 1846 with the European population of Port Phillip District expanding and frontier conflict a matter of public anxiety, McMillan’s reports sparked a heightened reaction to the missing ‘White Woman of Gippsland’. Two search parties travelled throughout Gippsland, bringing much disruption and more violent deaths to the Gunai Kurnai despite there being no firm evidence of a kidnapping.